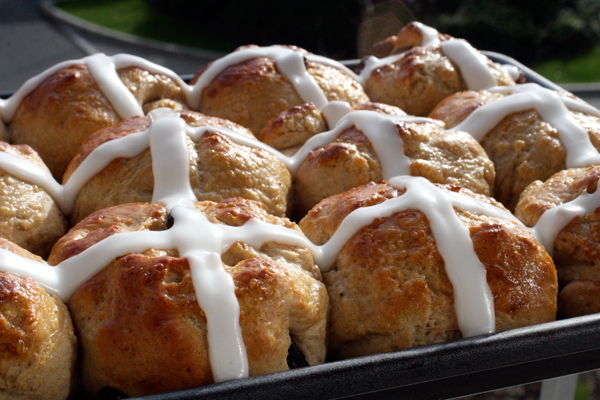 As it comes up to Easter, all of the grocery stores around the UK start selling hot cross buns. So I figured I’d give them a go, having never had one in my life. They turned out alright, except that I’m pretty sure I overworked the dough a bit, so be sure to avoid that! 1. Heat the 3/4 cup milk until lukewarm, then gently stir in the yeast and 1/2 teaspoon of sugar. Allow to sit for 10 minutes until it gets foamy. If the yeast does not foam, it is either too old or the milk was too warm, so dump the mixture and start again. 2. In a large bowl, combine the flour, brown sugar, cinnamon, cloves, allspice, nutmeg, salt and orange zest. 3. Create a well in the middle of the flour mixture and pour in the milk and yeast mixture. Mix until combined, then add 2 eggs and mix until the yolk disappear. Add the butter and raisins then mix for about four minutes, until the dough is smooth and elastic. 5. Once the dough has risen, punch it down once, and turn it out onto a lightly floured work surface. 6. Divide the dough into 12 equal pieces and form each piece into a round ball. (I used a scale to make sure everything was even.) Place each ball onto a baking sheet lined with baking parchment, making sure they are evenly spaced. 7. In a small bowl, whisk together 1 egg and 1 tablespoon of milk. Brush the tops of each dough ball with the mixture, and save the remaining egg wash. Place a clean towel over the tops of the rolls and set in a warm place to rise for 30 minutes. 8. Preheat the oven to 400°F (200°C). Then brush the tops of the rolls again with the egg wash before placing in the oven to bake for 10 to 15 minutes, or until golden brown. 9. Allow the rolls to cool completely on the baking sheet, then combine the icing sugar and 1 tablespoon of milk. Place the mixture into a pastry bag (or a Ziploc bag with the corner snipped off), and pipe a cross over the top of each cool bun.